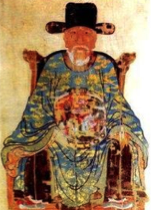 Nguyễn Trãi was a Vietnamese poet, Confucian scholar and great military strategist who made a good reputation for himself in 15th century Vietnam. He served his king and government in many capacities and was so well regarded that many of the common people believed that he was capable of performing miracles. He had a close relationship with the king who was struggling to free his country from Chinese Ming Dynasty rule and, through a number of inspirational statements and poems, he always had the people on his side. Trãi is credited with the bold and statement known as “The Great Proclamation on Victory over Ming” which followed the victorious war of independence with the Chinese. Nguyễn Trãi was born during the year 1380 in Thăng Long, a city now known as Hanoi. At that time his place of birth was the capital of the Trần Dynasty, although this era was coming to an end. He did well enough at school, passing examinations that earned him a place working for the government. He served at a time of great unrest in Vietnam, especially when the Ming forces invaded in 1406, quashing all attempts at rebellion in their quest to make the country a new Chinese province. Trãi was an unwilling victim of despots though and he joined other rebels gathering in the mountain regions, offering his skills as a highly able propagandist and strategist to the cause. Slowly but surely they gained the upper hand and, having defeated the insurgents, the new Lê Dynasty began in 1417, lasting ten years. For his efforts Nguyễn Trãi’s standing at court increased dramatically but he had many enemies all around. Nepotism and jealousies prevented him from achieving regent status when the king died. He gradually faded into the background and retired to a mountain retreat where he enjoyed writing poetry and meditating every day. Tragically though he was not allowed to live out his final days in peace. The new young king visited his house and, according to some reports, it was to have sexual relations with one of Trãi’s wives or concubines. What happened next is unclear but the king died of an illness shortly after this visit and Trãi was accused of being responsible for the death. According to ancient custom he and all his extended family members were sentenced to death. There was no pardon so all were cruelly exterminated although, twenty years later, the popular king Lê Thánh Tông did announce an official pardon, exonerating Trãi of all blame. Nguyễn Trãi died sometime during the year 1442, aged 62.